An article, typewritten from the Arizona Weekly Star in March 1880, described the "Mine with the Iron Door and the Nine Mile City of the Santa Catarinas. Martin & Welden's Camp, Feb. 2, 1880." The Santa Catalinas were then called Santa Catarinas. One of the lost mining tunnels found in the Santa Catalina Mountains, near Tucson, Arizona. Photo by Robert Zucker. The articles tells the story of two miners who arrived on January 10, 1880 and told the Star newspaper about their hunt and exploration for the Nueva Mia Ciudad (nine mile city) and the mine with the iron door. They said they stopped near a Mexican town where they were shown a handwritten diary written about the events of those days, including directions how to find the mine with the iron door. The Mexican said it belonged to his grandfather and would not part with it. The two men headed for the Cañada del Oro and went up the canyon to find the place "where water would exist the year round." They found a canyon that was walled on the three sides and discovered a stairway cut in the rock. They found a vaulted chamber that closed into a narrow passage. In one place, they said they saw an inscription engraved on the wall in Latin - "Dominus vobiscum." They followed through and found a tract of land covered with pines and oaks. As they traveled in an easterly direction to the Nueva Mia Ciudad, they came to a stream of water alive with trout and "shining particles in the stream." The next day, they moved on for another mile where they came into ruins, which, as we proceeded grew larger and could be seen for two miles in width. To think, probably, that we had walked four miles when we came upon a stone building (granite and marble) that was in a fair state of preservation excepting the roof, which had fallen in; the structure was something after the style of the Old Cocospari church in Sonora, and we decided that this must have been the place of worship of the people of this once populous city. Here we spent some time in looking over this ediface searching for gold and silver which was buried in the church, but having no tools, we could do nothing." "We then changed our camping ground and commenced to look for the mine with the iron door, and after three days of searching we found it. The old door was eaten off by rust and the iron bars that secured it lying down at the mouth of the tunnel. We were afraid to enter for fear of wild beasts; but the love of excitement got the best of us and we entered. We saw at the commencement that the vein was about ten inches wide with a talk gouge, and, as we neared the end of the tunnel, which must have been 400 feet in length, the air became very foul, but we pushed through; there we found some old iron resembling in shape the pick, we took it up and struck it in the vein and to our amazement the gold rolled down in nuggets on the floor." The author of the article witnessed 100 pounds of pure gold that the miners displayed. The Daily Los Angeles Herald published an account in 1882 that described several men, Isaac Goldberg, P. W. Donner and others who, 15 years earlier in 1867, discovered "fabulous gold mines that were supposed to exist somewhere among the summit peaks of that rocky and almost inaccessible range of the Santa Catalina mountains. They discovered a hge ledge of very fine copper ore. In 1882, Goldberg went back to find the lost mine ledge. The account said "the ledge was located by Isaac Goldberg, Andrew Cronley and James Lee, and Samuel Hughes was located In an extension...The croppings brought in were very rich, and average specimens gave by assay over 30 per cent copper." The February 17, 1891 edition of the Tombstone Prospector reported a recent "New Discovery." It was one of the earliest mentions of a lost city and a mine with an iron door. "Early in the present decade a prominent journalist of this city discovered in a "rugged and precipitous defile" of the Santa Catalinas the ruins of a long lost pueblo, adjacent to which were numerous shafts that had been sunk in ages past, for in one of them was a giant suhuara fully 70 feet high, only a small portion of which appeared above the surface." "A few years later, while hunting for this relic of the past, the editor discovered in one ot the box-canyon cliffs an old weather worn iron door leading to an ancient Jesuit mine, the seclusion of which was so perfect that it was not necessary to be made a matter of record. Lately a new and important discovery has been made, being the finding of a flight of stone step leading down into a veritable cryptogram of working, which show ruby and native silver in vast extent, sparkling with gold. And the most wonderful thing of all, which the posted few have been trying to keep quiet, is that the old iron door has been found to be another opening to this treasure vault, which is now known to lie immediately beneath the "let pueblo" of the first find." It was only one of several accounts published in Arizona newspapers during the late 1880s. An article in the Arizona SIlver Bet in 1892 discussed the legends of various lost mines in California, New Mexico and Mexico, but did not mention any lost mines in Arizona. The Tombstone Epitaph published an article in its September 20, 1891 edition that described a wealthy miner who went to search for the "lost mine" near Arivaca. He had previously discovered ruby quartz in a mining dump supposedly left by the Spaniards a century before. "it had been worked a century or two ago by tho Spaniards and their being driven away by the savages. Charts showing its location were preserved which were found years ago among some church papers in Spain. They were brought to this country by a Jesuit priest in 1887 who located a large amount of bullion but could not find the mine. Mr. Cussenberry is satisfied the mine he found is the right one. The party will leave in October. "A lost gold mine In the Catalinas has been searched for by Thomas Bullock and an Indian. The mine is supposed to have been found. Years ago a soldier from Lowell located the property. Later he was discharged and staid at the mine, making his living all the time. The mine got the reputation of being a rich one. The soldier died. Previously to that he left sorne powder, fuse, etc., at Mr. Bullock's. Since then Bullock has been grub-steaking the Indian, and for a year from time to time the search has been prosecuted. Two weeks ago the Indian brought a crowbar down to the ranch, supposed to belong to the soldier. He had not found the mine, however, he said. A day or two ago the Indian was In the city and started for the mountains with a burro outfit, reported to have been furnished by a prominent local mining man. It is supposed tho Indian has found the mine, and is now being staked to work it." An article reprinted in several Arizona newspapers in June 1895 downplayed any significance to the lost mine legends in Arizona and California. "The Santa Catalina range, one of the grandest and most sublime of the great upheavals in southern Arizona is the home of lost mines. Within its mysterious and labarynthine depths the legends of the past have root and radiation. Here romance and reality were conceived and born, the lost mine has its home and over it the gaunt spectre of the past, holds its unceasing watch. The lost mines in Arizona are as ubiquitous as the lost tribes of Israel. They exist in story and song, they are ignus fatuous of the gold seeker and, Jack O'Lantern like, have lured many abrave man to his grave. The end is stilt afar off, for the legend of hidden gold never dies." "Occasionally a "find" is made but it brings no lasting joy. 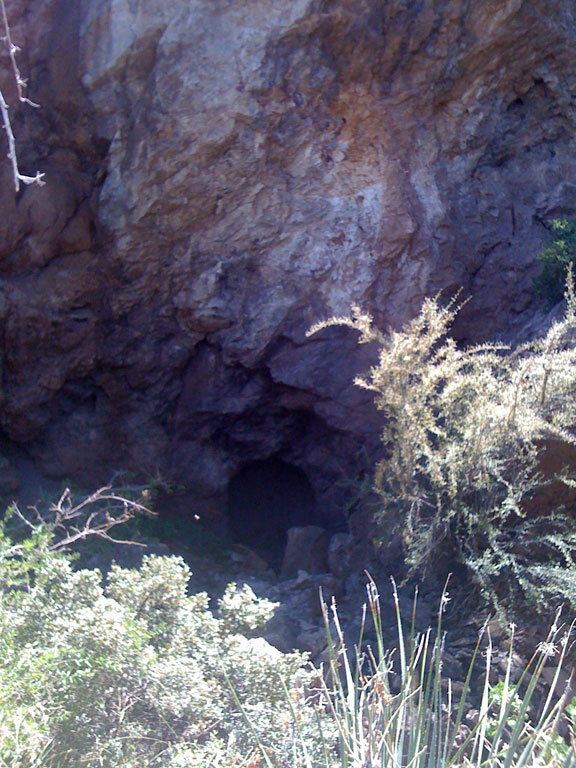 The fabulously rich "Barn Door" mine of the Santa Catalinas has been discovered, so many people think, but even the identity of this Is in dispute. Some miners who have examined it declare it to be nothing but a natural rift in the face of a great bluff made in one of nature'a throes when the world was new, but others, good men and experienced miners too, can see in the cavernous opening in the rock the handiwork of the ancient gold seeker, but all agree that, so far as rich mineral Is concerned, there is nothlng in it. But this wilt not deter men from braving anew dangers in a hopeless quest of which there is no end. Evidences of former towns are plentifully scattered throughout tho fastnesses of the Santa Catalinas, and the ruins of arastras, where the Aztec or Jesuit slave once crushed his ore, are numerous, and these appeal strongly to the venturesome, but by whose hands they were wrought and worked or from whence came the glittering gold they sought is a mystery shrouded in the dim uncertainty of the past, and which time with its erosive hand is ever thickening, Tucson Citizen"
Several Mexicans reportedly discovered a thirty foot tunnel in the Santa Catalinas, according to an 1896 account. They believed it was an entrance to an old mine. Nearby, they found "several assayer's cupels and some ore carrying gold." The article mentions that "Nobody knows of any mines that have been worked in recent years in that vacinity."